RANCHO SANTA FE — Diners who have visited Innfusion at the Inn at Rancho Santa Fe recently may have noticed some subtle differences in the restaurant’s menu. If you have noticed you have probably been tasting the handiwork of Todd Allison, the new executive chef who came on board around the first week in July. Allison said he does plan to make changes to the menu, but not a lot of changes right away. “Too many changes would rock the boat too much. I want it (the transition) nice and smooth,” he said. “What I am getting (from customers) is ‘We miss the old, but the new is good,’” he said. But, the more things change, some of the menu items will stay the same, like the ever-popular Royce Salad, which will stay on the menu. “It is a historical tradition,” he said. One of the changes he made right away was switching to strictly organic eggs and he is looking into making all the dairy products used in his kitchen organic. And he plans to take this organic attitude to a whole new level. He plans to turn the citrus orchard behind the Inn into a garden where he will be able to give guests more of a farm-to-table experience. When it can’t be grown on site, Allison said he plans to support local farmers as much as possible. Allison said his menus will reflect the seasons of the year and he can hardly wait to start harvesting from the garden he and his staff will work year-round. The Inn was sold by the Royce family after more than 50 years of ownership to JMI Realty. The new owners, who pledge to be mindful of the history and tradition associated with it, plan a $12 million renovation project which is set to begin right after the Labor Day holiday. The plan includes refurbishing the guest rooms, sprucing up the pool area and enlarging and updating the spa. The current Garden Room will become the new dining room and the kitchen will be enlarged and updated. A part of the plan was to hire a new, dynamic, forward-thinking chef. The chef that was chosen for this project was Allison. He began his culinary career when he was 15 as a dishwasher at Chez Loma in Coronado for pocket money and to finance his surfing trips to Mexico. Through the years he began cooking and at the age of 21 decided to make cooking his lifelong career. “It just excited me. I don’t mind spending 12 hours in a hot kitchen sweating,” he said. In addition to attending culinary school, he trained with celebrity chefs James Boyce and Michael Mina. He worked his way up and became the executive chef at Bollinger’s in Santa Barbara, Hilton Checkers in Los Angeles and Anthony’s in San Diego. 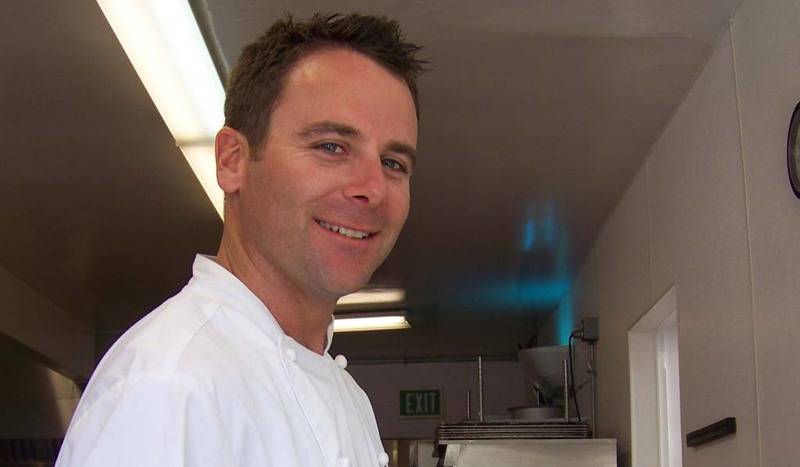 Now at age 34, he is ready to tackle the kitchen in Rancho Santa Fe.